Click here to know more detail about JSA. Camp Bonifas was named after an US soldier who was axed to death in the JSA in 1974. 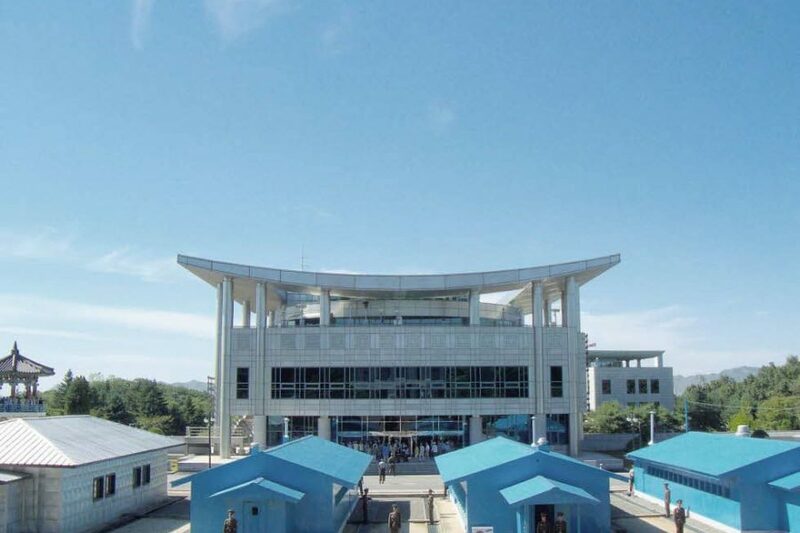 It is a large South Korean military installation that serves as the base camp of the United Nations Command Security Force in Joint security area (JSA). For most of post-Korean War history, the southern side of the JSA was jointly patrolled, but since 2004, it has been entrusted exclusively to the South Koreans (although a small contingent of Western, mostly American troops remained). the new Freedom House was constructed on 9 July 1998. It provides facilities for South-north Korean contacts, meetings and exchanges, and houses the Liaison Office with North and South Korea. When the original Freedom House was built in 1965, Red Cross representatives from the South used it to make contacts with their North Korean counterparts. The “Bridge of No Return” is located at the west end of the JSA and is bisected by the MDL. In front of the “Bridge of No Return” is also where the tragic Ax Murder Incident occurred in 1976. *Your full name and passport number are required to join the tour. Please write All your members' passport numbers and names here. -Dress code violators will not be permitted tour to the JSA. 5) Any form fitting clothing of any type including tight knit tops or pants. – Payment can be done by bank transfer or credit card before the tour day of JSA. -There is 100% charge 2 days before tour day. USFK Regulation these countries are designated to the Panmunjom tour. – Above these countries can apply to the Panmunjom tour, we need your color scanned passport (only the first page with photo), as attached and send us by email at least a 4 days prior the tour day. –– When you take a photo of your passport, your photo and detailed information should be clearly taken. Tourists should scan their Overseas resident registration issued by Korean Embassy and attach it in an e-mail along with their passport number and name at least 4 days prior to the tour day.